According to the announcement, in a call that took place on Monday Beijing time, Mr. Xi congratulated Mr. Trump for “winning a historic election,” and the president-elect thanked the Chinese leader for his well-wishes. “During the call, the leaders established a clear sense of mutual respect for one another, and President-elect Trump stated that he believes the two leaders will have one of the strongest relationships for both countries moving forward,” the statement said. No mention of whether Mr. Trump’s repeated campaign threats against Chinese trade practices came up, nor his statement that climate change was a hoax perpetuated by the Chinese, nor his get-tough promises on economic relations moving forward. Reince Priebus, who was chosen on Sunday to become Mr. Trump’s White House chief of staff, defended the selection of Stephen K. Bannon to serve as chief strategist on Monday and pushed back against suggestions that Mr. Bannon is racist and anti-Semitic. Civil rights groups such as the Anti-Defamation League and the Council on American-Islamic Relations condemned the selection of Mr. Bannon, pointing to the divisive views promoted by Breitbart News, the nationalist website that he runs. 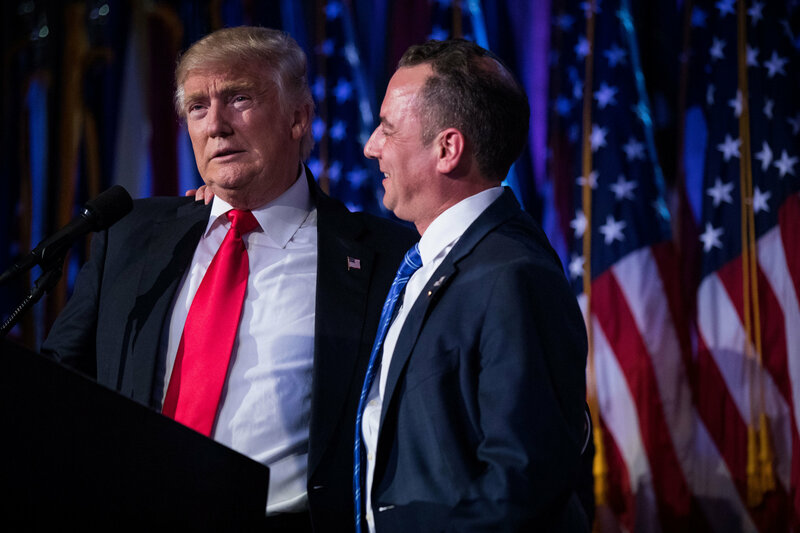 Mr. Priebus said that he agreed that Mr. Trump still had more to do to bring the country together and that it would be healthy for him to deliver a unifying speech to ratchet down some of the things he said in the heat of the campaign battle. “He wants to make you proud of your country and serve you,” Mr. Priebus said. Trump thinks popular vote should prevail? In one of the odder moments on the “60 Minutes” interview broadcast on Sunday night, Mr. Trump seemed to suggest that the president should be chosen by the popular vote, not the Electoral College. That would mean his rival, Hillary Clinton, would be inaugurated in January. Pick a fight? Wouldn’t be the first time. Mr. Trump’s next task is to choose people who will serve as the principal public faces of his administration — the ones who articulate his vision to the public and defend it against critics at home and abroad. Those jobs include secretary of state, Mr. Trump’s emissary to the world; attorney general, who will personalize Mr. Trump’s definition of justice; and defense secretary, who will wage war for the new president. He will also have to choose a White House press secretary, who will spar with the news media. Mr. Trump did not have to ask for Senate permission to pick Mr. Priebus as chief of staff and Mr. Bannon as chief strategist. (And he can name whomever he wants as his spokesman.) But the top three cabinet jobs are all subject to a confirmation vote, and that can lead to trouble. The president-elect will have to decide whether to send up consensus nominees who are likely to pass bipartisan muster, or to challenge the Washington establishment with novel or controversial picks. The decision on which way to go may spark the first internal fight between Mr. Priebus and Mr. Bannon, who see the political world in very different ways.